We taught how God used a young Welsh slave boy to bring the gospel to our small nation. How God used the worst occasions in Patrick's life, being a slave boy, to change his heart forever. We learned together how no-one is unimportant to God, that God can use any of us.We learned how God spoke to Patrick through dreams and visions. We learned how Patrick was obedient and followed the call God put on his life. And we learned about Patrick's rich passionate love for the triune God. To remind the children that our God is three in one, Father, Son and Holy Spirit we then made shamrock sun catchers to take home. 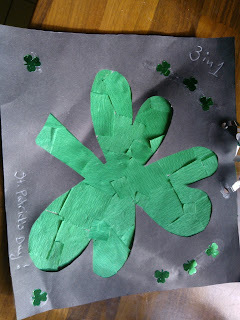 Before the lesson you need to cut out the shape of a shamrock on black paper for each child(just draw three hearts!). Each child needs a square of some light transparent foam for the back. I used the protective wrapping from new drinking glasses I had bought! But you could easily buy some or use baking / grease proof paper. Anyway, let the kids go crazy sticking lumps of crepe paper on their foam or whatever and when they are done glue/tape it to the back of the black paper. Punch 2 holes in the black paper, add some ribbon and extra decorations if you wish and voila! 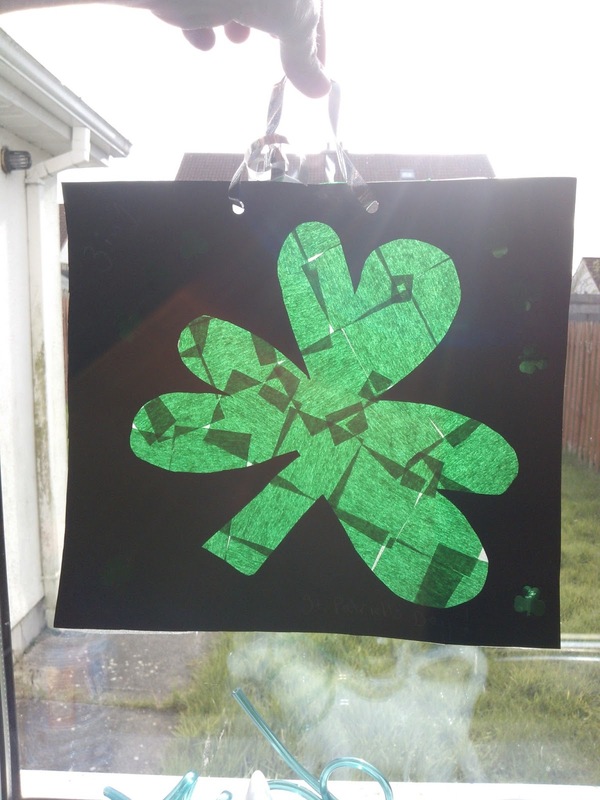 A lovely eye catching shamrock sun catcher!